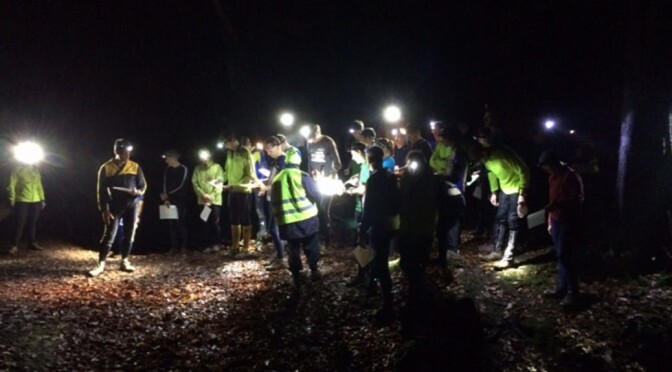 Claro hosted a YHOA Night League (Level C) Event at Killinghall Moor Country Park, Harrogate, on Saturday 28th November 2015. Details of the YHOA Night League are on the YHOA website and current league standings are here. DIRECTIONS: The area is approximately 2 miles northwest of Harrogate Town Centre to the west of the A61. Follow the highway signs to the Park (signed as Killinghall Moor Community Park) from the traffic lights on the A61 0.75 miles north of town centre, 0.5 miles south of A59 /A61 roundabout. Take Jennyfields Drive and proceed west, then after 1 mile turn left onto Saltergate Drive and then Barberry Close (Sat Nav/on-line maps: Barberry Close, Harrogate). The event will be signed from Jennyfields Drive. Please check the Claro website for any final updates before travelling. PARKING: Parking is in a free public car park near Registration. Please exercise consideration towards non-orienteers. Registration is in the Community Centre/Pavilion on the eastern edge of the car park. The start will be about 100m from registration. TERRAIN: Mostly runnable parkland and areas of scattered woodland. Due to the constraints of the area, the long course is likely to have at least some route choice options that could use public roads, although these are minimised, will not be extensive and there will be viable alternatives. Runners should consider appropriate footwear. It is quite wet in the woodland areas and there is a stream that is crossable in places other than the marked crossing points. The Medium and Short do not have this option, so U16s are not excluded from entering them. The nature of the terrain is such that for several legs it will not be possible to achieve TD4 or 5, but courses have been carefully planned to try and make best use of the available terrain. MAP: 1:5,000 scale with 5m contours for all courses. Printed on waterproof paper. Control descriptions will be printed on the map and available loose at registration (not on waterproof paper). FACILITIES: The assembly area is adjacent to the car park and there are permanent toilet facilities in the Community Centre. DOGS: Dogs are allowed, but only in the car park/assembly area and must be kept on a lead at all times. SAFETY: Competitors take part at their own risk and are responsible for their own safety. If travelling alone, please leave your keys or a note of your details at registration. All competitors who start must report to download even if they retire. Whistles and full leg cover compulsory. Waterproof jackets may be compulsory in the case of bad weather. In the unlikely event of cancellation, details will be posted on the Claro website – www.claro-orienteering.org.uk. Information can also be obtained by phoning the organiser. PHOTOGRAPHY: In accordance with the British Orienteering Child Welfare Policy and Procedures, the organiser of this event requires that any person wishing to engage in any video, zoom or close range photography should register their details with the organiser before carrying out any such photography. The organiser reserves the right to decline entry to any person unable to meet or abide by the organiser’s conditions. The club policy is here.